With no gluten, meat, dairy, soy, or nuts, this lively dish by one of our favorite food bloggers, Beth Manos Brickey of Tasty Yummies, is free of everything—except flavor. The mushrooms and corn are grilled, but they can easily be prepared in the kitchen: Cut the marinade-coated portobellos into 1⁄4-inch-thick strips and cook them in a large pan over medium-high heat until tender, 8 to 10 minutes; cook foil-wrapped ears of corn on a baking sheet in a preheated 450ºF oven for 20 to 25 minutes. Preheat a gas or charcoal grill for medium-high heat, about 450ºF. Whisk together oil, cumin, chili powder, lime zest and juice, garlic, salt, and a pinch of pepper. Mix until well combined. Cut 2 squares of aluminum foil large enough to fully wrap an ear of corn. Place 1 ear of corn on each square. Drizzle a small amount of the marinade over each ear, rub to evenly coat, and wrap tightly in the foil. Coat the mushrooms with the remaining marinade. Grill the foil-wrapped corn for 20 minutes, turning every 5 minutes. While the corn is cooking, grill the mushrooms for 5 minutes on each side. Transfer the corn and the mushrooms to a cutting board to cool. When cool enough to handle, cut the kernels from the cobs and slice the mushrooms into 1⁄4-inch-thick strips. 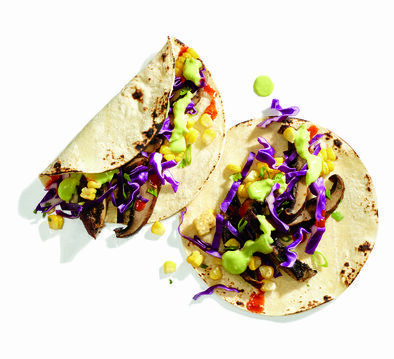 Top the warm corn tortillas with the mushroom strips, corn kernels, cabbage, cilantro, green onions, and avocado cream and serve. Combine all of the ingredients in a blender. Add 2 tablespoons of water and blend until smooth, adding more water if the cream needs thinning.